This will definitely be the "good eats" edition of this series. I've been really enjoying food lately; believe it or not, I do go through phases with food, and I am either cooking all the time, or not really interested in cooking at all (ie, get me to The Iron Cactus for a burrito bowl with tofu!). Thankfully (or not? ), not only are we really broke (and thus can't afford to go out for food), I'm in a "cooking phase" right now. And oh, it's been good. Here's some of what I've been making/eating lately. 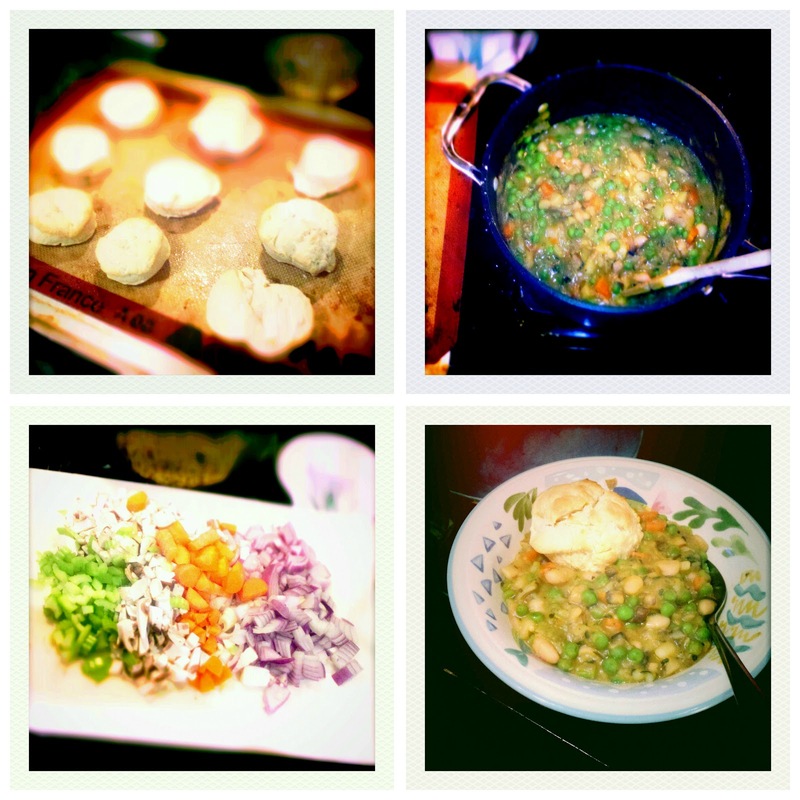 Last Wednesday, the day Scott returned from his business trip, I was feeling celebratory and decided to make one of my all-time favorite dishes—white bean stew with biscuits. I got this one from Ohdeardrea, but it's adapted from a recipe that originally appears in Veganomicon. Drea made some changes to the recipe that I fully endorse. To view Drea's recipe, click here, and do try it if you can ... it's my favorite comfort food ever, and I can't wait to make it again. Yum. I had this glass of wine right before a shoot on Friday that I desperately needed to relax during. Fortunately for me and my partners in the shoot, it totally did the trick. I was at a place called Cafe Flore in the Castro district of SF; I recommend it, the wine was great & the staff was so friendly. On the right is the delicious whole wheat pasta I made yesterday afternoon. The marinara sauce is homemade, and included the wonderful chard I got in my CSA box, as well as garlic, red onion, celery, fresh marjoram + thyme + rosemary ... it was just ... heavenly. 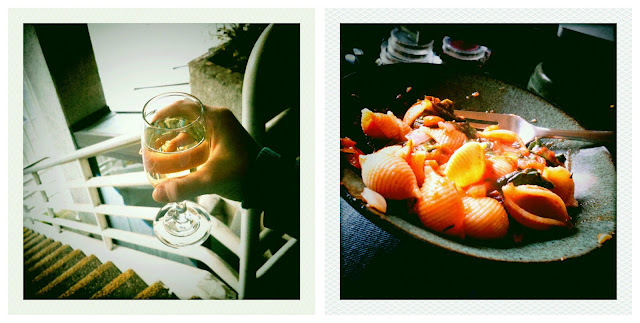 I was really craving both pasta and chard (did you know it was even possible to crave chard?) so this really hit the spot. 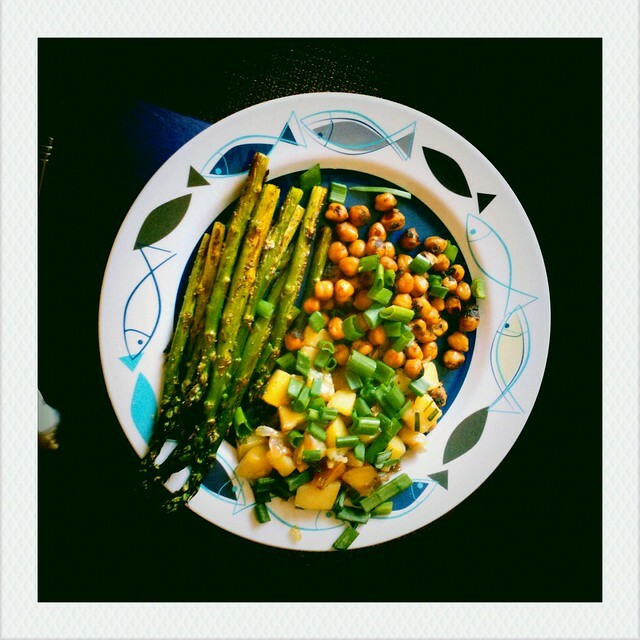 On Saturday, after my trip to the farmers market, I made a really special brunch for myself: broiled asparagus, which had been covered in local olive oil, salt & pepper (and yes, as usual when I broil, I set off the fire alarm); wasabi/ponzu chickpeas a la Vegan Yum Yum (SO FREAKING GOOD); and home fries with garlic, red onion, rosemary salt, pepper, red pepper flakes & green garlic (!). It was so, so good, and actually quite balanced! Seriously, best breakfast ever. I have been eating too much meat lately... seriously my body is not liking me for it... your food all looks yummy! And the new layout, LOVE! Is spring springing near you yet? You need to get thee to a farmers market, STAT! You eat so well! I've been into bowl meals lately - grain, protein (meat or beans), veggies, and spices. Recent favorite is lemon couscous with chick peas and carrots. Last week I made tacos that had a black bean filling, and I sauteed the black beans in olive oil with garlic, onion & diced daikon radish. It worked out really well even though Scott was initially skeptical! That's the great thing about tacos; to me, anything goes. I also topped the tacos with lettuce & diced mushrooms. Mushrooms on tacos are actually really good, who'd have thought? That whole wheat pasta dish.. looks.. amazing!